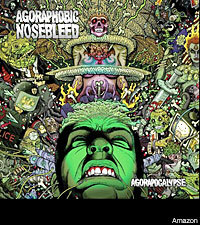 There's a lot to look at if you purchase a hard copy of Agoraphobic Nosebleed's new release, 'Agorapocalypse.' It may look like a rectangular patch of misty green, but up close there's plenty of collage'd detail, promising something new every time it's seen. Though there's beautifully stylized depictions of nuclear war, drug use, police brutality, and a greedy businessman, the art is less shocking to the senses by it's vivid colors and comic-like appearance. The band has had a storied history of grotesque album art, and designer Florian Bertmer was aware of this. "The 'Agorapocalypse' artwork was rather tricky because I felt there was a lot of pressure on me to come up with something that would represent the new Agoraphobic Nosebleed L.P.," Bertmer explained to Noisecreep. "I talked with Hull and Randall [from the band] for hours about it and we decided to give it a kind of 80's trash metal aesthetic because of Agoraphobic Nosebleed's new musical direction. I tried to incorporate as many iconic characters to give the whole piece a claustrophobic appearance." And for trivia purposes, the large green head in the middle is based off of a photo of Bertmer himself. "I'm way prettier in real life, though," Bertmer assured us. "At least I hope so."